LOGAN, Utah – In 2014, Campbell Scientific, Inc., celebrates 40 years of innovative measurement by releasing their newest data-acquisition product: the CR6 Measurement and Control Datalogger. The CR6 combines new technology with the best features of Campbell Scientific’s variety of legacy dataloggers. The multipurpose CR6 is versatile enough for use in many different applications, and it is flexible to meet changing requirements. The flexibility comes from Campbell Scientific’s new universal terminals. 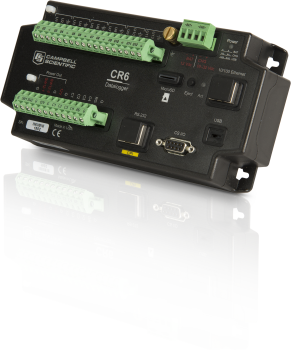 Traditional terminals have been limited to a single sensor-output type; the 12 universal terminals on the CR6 are software configurable for connection to sensors with various output types. The CR6 provides further flexibility with its ability to perform static vibrating-wire measurements without any additional peripheral. In addition to flexibility, the CR6 offers high-quality measurements, fast processing speed, and easy wiring, all in a compact size. It also features integrated communication options, onboard microSD memory card storage, internal power management for reduced power consumption, and surge and overvoltage protection. Typical of Campbell Scientific dataloggers, the CR6 is rugged for reliable and accurate measurement data—even in harsh, remote environments. Campbell Scientific’s history of developing innovative products began in the 1970s, as one of the first to offer low-power, high-precision dataloggers for use in the field. The company has developed increasingly powerful dataloggers to satisfy customers’ measurement needs. To date, Campbell Scientific has manufactured more than 250,000 dataloggers. Campbell Scientific has a reputation as a worldwide leader in dataloggers, data-acquisition systems, and measurement and control products. To learn more about Campbell Scientific, Inc., or to ask questions of the company’s highly trained technical and sales support team, please visit www.campbellsci.com.